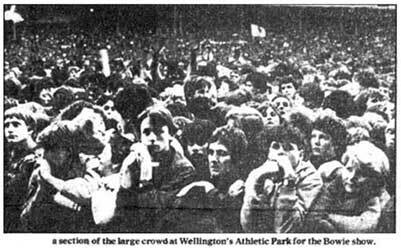 The first 1983 New Zealand concert was held outdoors in Wellington at Athletic Park. At this venue, Bowie drew an audience of around 40,000 (from a city of only 200,000!). 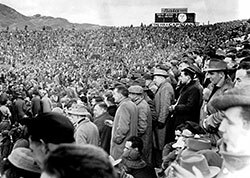 Historic scenes of the old rugby field known as Athletic Park. 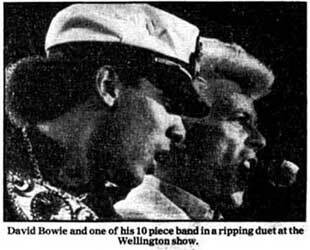 The venue was demolished in 1999 at which point, big rugby games were transferred to the newly built Westpac Trust Stadium (where Bowie played on return to the city in 2004). 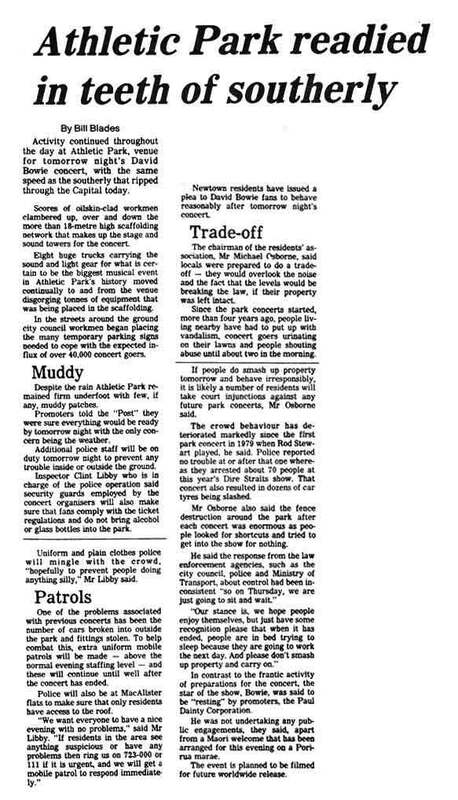 Incidentally, the site of Athletic Park is now a retirement village! 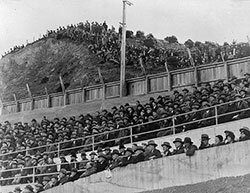 To deal with the influx of people into Wellington, three special flights - all fully booked - were arranged by Air New Zealand. 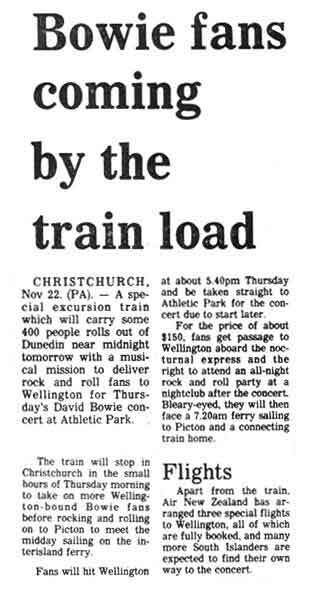 An excursion train (accommodating 400) was also provided for fans coming from Dunedin and Christchurch. 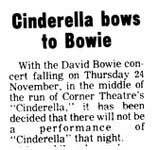 The Corner Theatre - which was in the middle of a run of "Cinderella" - also consciously stopped their performance for the night of Bowie. Above: Ticket scan from TJNWorldEnterprises. 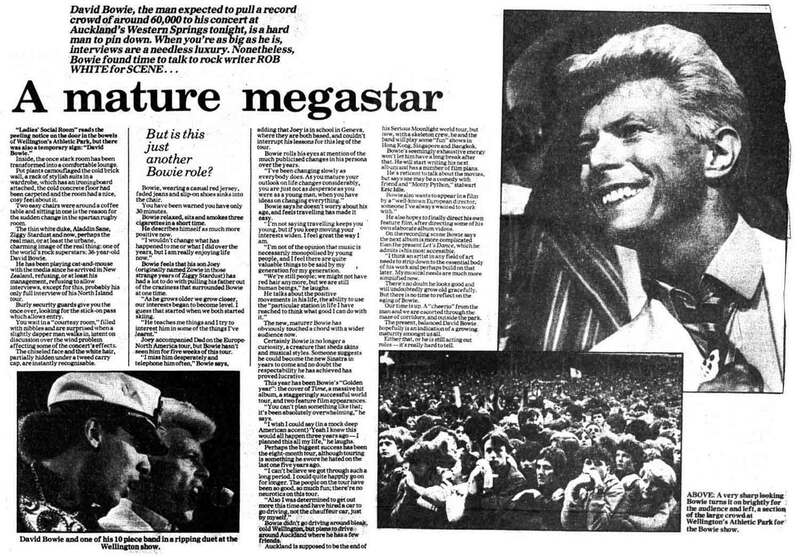 At the Bowie concert, concerns over crowd behavior (it had been steadily deteriorating over the previous 4 years at Athletic Park) were raised.The concert included some boisterous bottle throwers and at one point, he stopped the show when security informed him that a person was down and not being attended to. 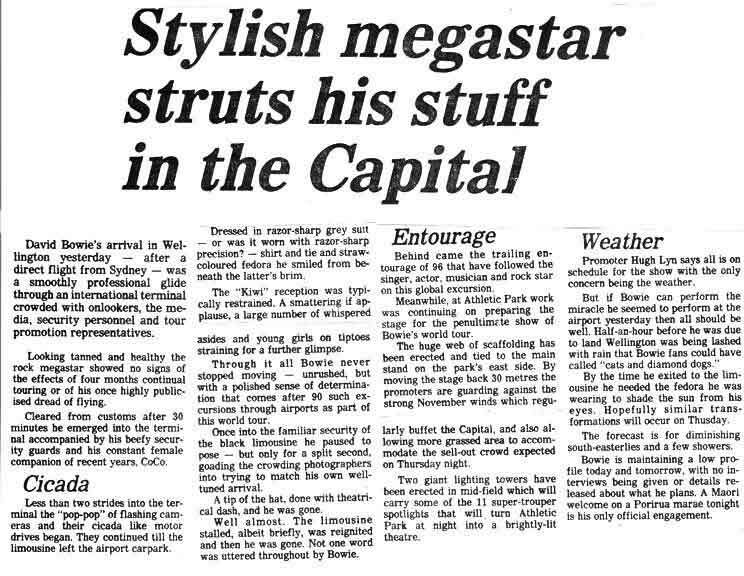 Wellington news clippings. 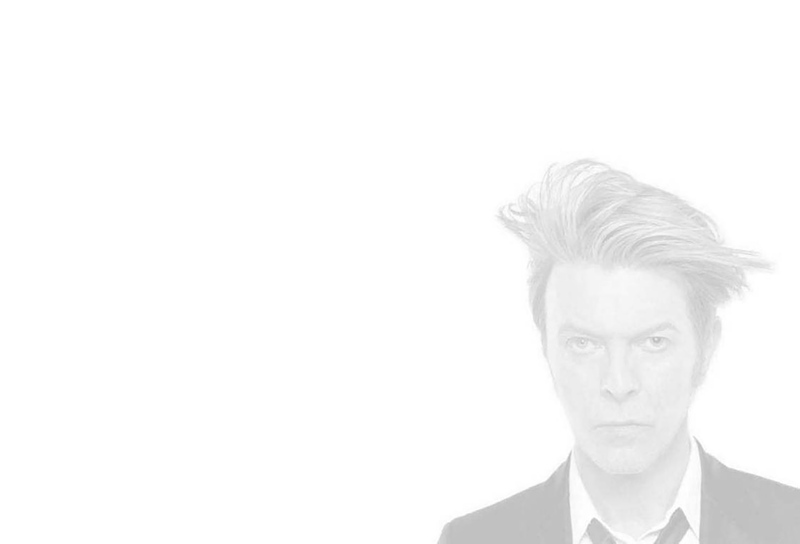 Scans provided by Jacqui Matheson and sonofsilence (click to enlarge). 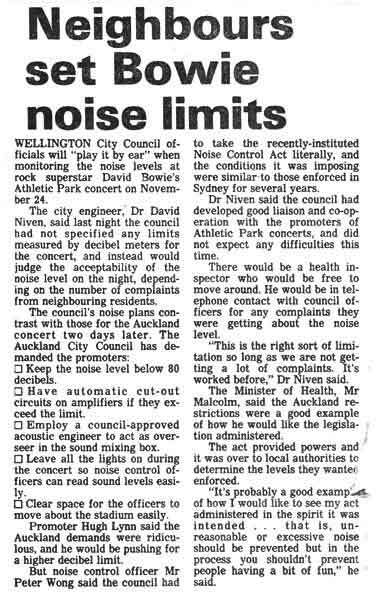 Anger over public vomitus and urination was relayed from Wellington residents to Auckland (which was staging the last concert of the main tour). 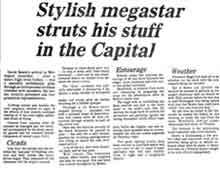 This caused some spectacular advance press. 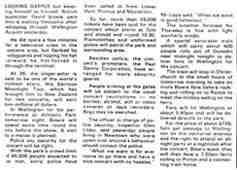 "Residents Fear Bowie Rampage" read one headline. 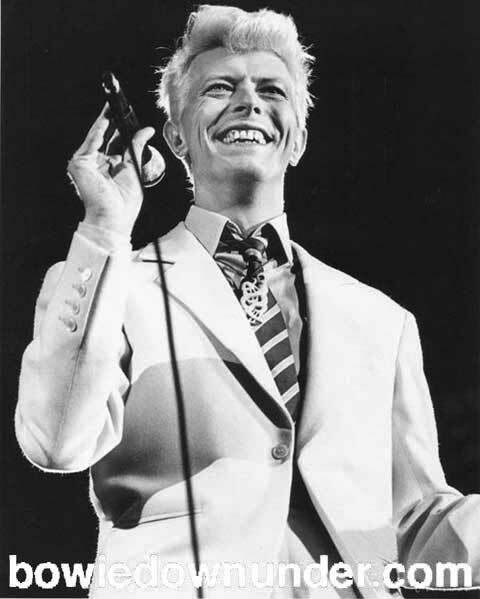 "Enjoy It But Behave Plea From Bowie" was another. 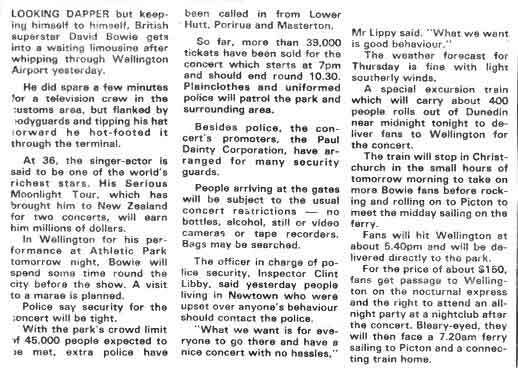 Bowie said "We are going to have a good time, just as long as people don't throw bottles and act like hooligans". 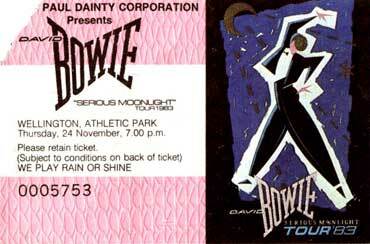 All NZ dates Bowie were supported by the Dance Exponents and also the Models. 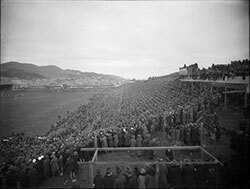 At Athletic Park, two giant lighting towers were erected mid field to turn the venue to a brightly lit theatre. 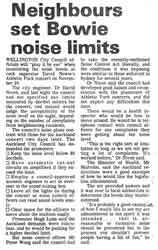 Pic from Wellington's Evening Post via Jacqui. 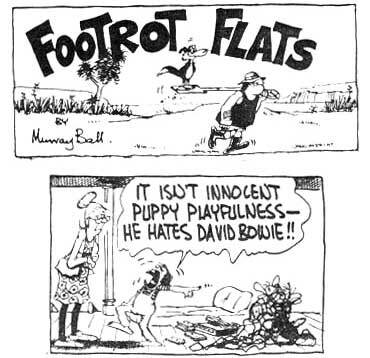 Above: The famous Murray Ball cartoon series Footrot Flats with Bowie theme. Sent in by Jacqui.